Almost half of recently immigrated children in Canada live in poverty, says a new report from First Call BC. The organization told reporters Tuesday that 45 per cent of people living in B.C. under 18 years old who had moved to Canada between 2011-2016 were poor. First Call BC considers children of families making below Statistics Canada’s low-income measure to be living in poverty. Many of those kids were clustered in B.C.’s major downtown cores, with the worst being Vancouver’s Downtown Eastside where three-quarters of the youth and children live in poverty. Nanaimo, Kamloops, Prince George, Kelowna, Chilliwack and Abbotsford-Mission also had neighbourhoods with a child poverty rate above 40 per cent. The report linked poor outcomes for immigrant children to the lack of employment assistance, language classes and barriers to requalification for professionals trained abroad. Using data from the 2016 census, First Call BC found that child poverty rates for visible minorities, Indigenous kids and those living with other relatives were about 18 per cent across the board. Georgia Brown, an Indigenous woman taking care of her two special needs grandchildren in Vancouver, spoke about her family’s growing struggle to just get by. Brown used to rely on several weekly community dinners when groceries ran low. But over the years, these programs have become overburdened and the situation has reached crisis levels. About 39 per cent of children in B.C. who live with non-parent relatives are poor, while virtually all of the 550 children living alone are poor as well. One in three Indigenous youth live below the poverty line, the report also found, saying that did not include children on reserves. The poverty rate for children on the Soowahlie 14 First Nations Reserve near Chilliwack in particular sits at 80 per cent. Similarly high rates on other reserves lead researchers to believe the true poverty rate for Indigenous children is much higher than one-third. “We’re dealing with an undercount,” Graham said. 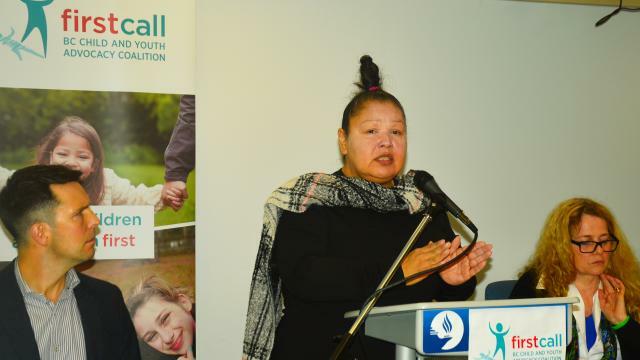 First Call urged the government to increase funding for First Nations children and community health services, and to implement a poverty-reduction strategy focused on Indigenous kids. For the past 15 years, half of the children living in single-parent, often female-led, families have been poor. This year was no different, with 48 per cent of kids in single-parent families living in poverty. The median after-tax take-home income for a single-parent family living in poverty is $15,470— $10,000 below the low-income cutoff. Single-parent families, as well as other low-income families, struggle to afford childcare. First Call called on the B.C. government to introduce $10-a-day childcare, an NDP campaign promise, as well as make childcare free for families earning less than $40,000 per year. The NDP had made $10-a-day childcare a central campaign promise during the 2017 election. However, the initiative was left out of their fall budget update and has caused division with the BC Greens.